Following Bulge in 1985, I was asked to do another game and given carte blanche to design it. I had been wargaming for the last 13 years and for my sins was the N. Ireland 1979 wargames champion. (Really!) Life went on despite the troubles. When I'd first started into wargames at the tender age of 12, my father and I had bought vast quantities of Airfix 25mm American civil War figures, painted them and fought battles. 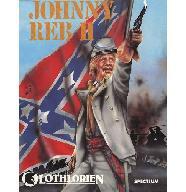 his lot were the Confederates, mine were the Union and we fought perhaps 20 or so battles on a 6' x 4' chipboard table. The battle was a simple bridge defence- Confedarate forces attacking in great quantities with Union troops hanging on until the trickle fed reserves came in and they could counter attack. It was no particular battle just synthesised from many. Once again my meagre artiostic skills were employed for the graphics with 4 phase (IIRC) animation for units- reloading and firing and shell holes for the artillery. The CBM 64 version was the first one- it was always easier going from the 6502 with 3 registers to the Z80. This game used the high res mode for the CBM-64. Standard mode was character (and most of the animation done using the built in sprites). I'd just got into the hi res stuff after doing Bulge on the Spectrum and thought it made it look better. The biggest difficulty was the Ai- particularly the bridge crossing. Writing that in assembler was challenging. Also the artillery shooting- picking targets and having fire zones. This game won Computer & Video games runner up strategy award (first was Microprose Submarine game). It took just 8 weeks from start to finish - I was really pleased with that. there is a review here 82% score.